The verse of the day is Psalm 119:76. May your unfailing love be my comfort, according to your promise to your servant. 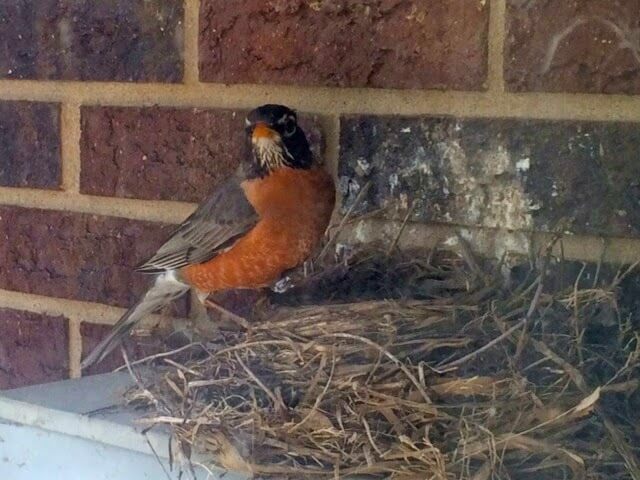 For the past week I have enjoyed watching a mother robin attending a nest of baby birds. On Monday I locked myself out of our office and had to go around to the back door to get in. When I turned the corner I heard loud persistent chirping and saw the male and female flying around and around in panic. That is when I saw the nest. They had built it on top of the electric meter by the back door. I stood on tiptoe to peek inside and the little featherless bodies were hardly moving. I could tell they had just been hatched by the egg shell remnants and the way they lay there exhausted from their entrance into the world. I quickly entered the building and hid behind the door to see what Mama Bird would do. Even though I was hiding she was very leery and aware of my presence, but eventually swooped down onto the nest to warm her hatchlings. Throughout the week I continued to check in on the little family and was impressed by the mother bird’s persistence in providing worms for her little ones to eat as well as both her and her mate’s protective ways of distracting anything that might bring harm. 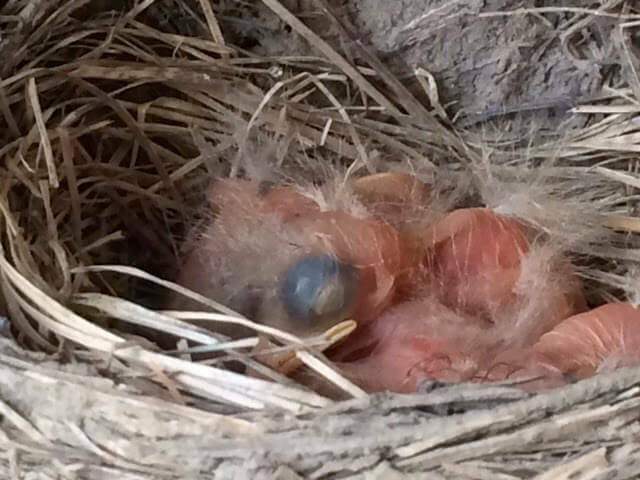 By the end of the week the babies were feathered and chirping loudly, calling again and again for more food. The little red breasts flew past the window over and over providing for their needs. I am amazed at the instinct that God has placed in His creatures. Somewhere deep in their makeup they know that they need to take care of their young. They do it persistently without giving up until their offspring are ready to fly and live on their own. This great God who put this natural inclination deep in the heart of a little creature is the same God who cares for us. He hears us when we call, knows all our needs, and provides everything necessary to sustain life while He has a purpose for us here on earth. His compassion never fails! I expect that in a few days the fledglings will fly away filled with strength gained from the worms and attention of their tireless parents. The same God who taught them how to care for their chicks is the same God who cares for you! They are all starting to launch, aren't they. This week the robin's nest is empty and I feel a bit of sadness knowing that my babies are all almost grown too. That is the goal but it is hard for their mama.